There’s something about summertime and dessert that just seems to go hand-in-hand. 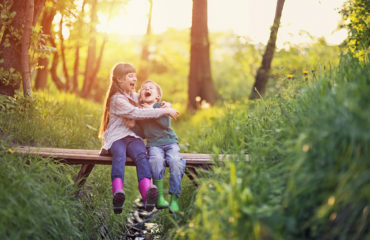 Summer is full of carefree, lazy days, late nights outside with delayed bedtimes, and fun-filled vacations where rules and routines are relaxed. Some of my fondest summer memories involve ice cream cones dripping down my wrists, the sweet taste of freshly picked strawberries for homemade strawberry shortcake, and sticky fingers from s’mores grilled over the campfire. So, I’ll be the first person to tell you to treat yourself to a little something sweet this summer. That said, dessert doesn’t have to be a decadent diet-buster, especially during the summer. You can indulge in sweet treats without going overboard. When the mercury rises, keep it light and take advantage of the abundance of fresh fruit that’s in season during the summer months. Because what’s summer without a little treat here and there? If you’ve ever had an in-season strawberry or peach straight from the farm or orchard, you know it’s impossible to buy one from a grocery store out of season again. There’s just no comparison. Fruits are naturally sweet and fat-free and contain fiber and antioxidants. This makes them a wiser choice than, say, an ice cream sundae, and they are the perfect place to start when you’re looking for lighter desserts. Get your grill on. If you’ve never grilled fruit before, you’re missing out. It’s an easy way to make dessert if you’re already outside grilling dinner. Grilling brings out the natural sugars in fruit, making for a sweet and unexpected finish to your BBQ. 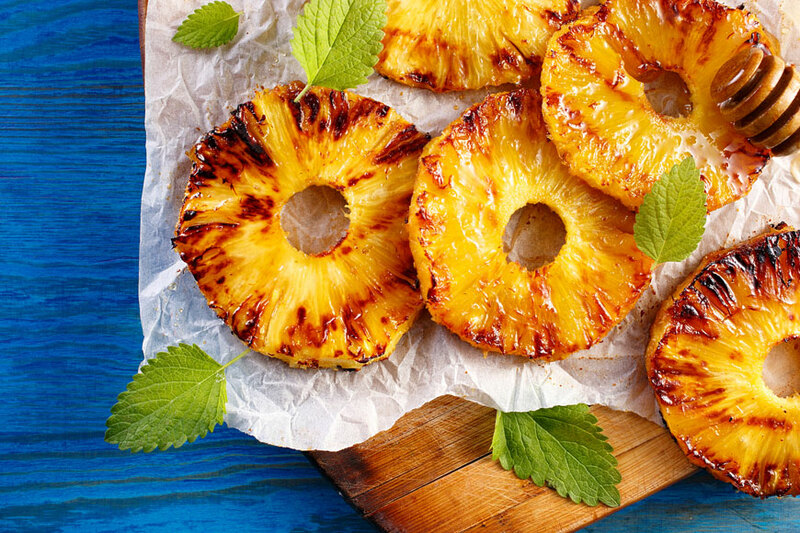 Peaches, bananas, strawberries, and pineapple are especially great on the grill. And who says kabobs are meant for meat? Skewer whatever fresh fruit you have on hand and grill some fruit kabobs for dessert! Pair grilled fruit with a cool vanilla frozen yogurt for the ultimate summer dessert. Cobblers, crumbles, and crisps, oh my! I always get confused about the difference between these three fruit-based desserts, but in my mind, it doesn’t matter because I would gladly eat any of them! There are some great, lighter recipes for peach crisp, blackberry cobbler, or blueberry crumble. Keep it cool and refreshing with sorbet. If you’re looking for lighter desserts without the fat, sorbets are great a great alternative to ice cream. Just keep in mind that sorbets do require a fair amount of sugar, so be sure to keep your portion size small. Or use agave nectar in place of simple syrup, like in this raspberry basil sorbet recipe. Savor summertime classics. I don’t know about you, but my summer isn’t complete until I’ve had strawberry shortcake with freshly picked, local strawberries. And while this treat isn’t the worst offender in the dessert department, it can easily tread into the unhealthy zone when paired with a dense, calorie-heavy biscuit and highly-processed frozen whipped topping. You can still savor this classic summer dessert however, just pair those strawberries with light angel food cake and Greek yogurt. Embrace the “icebox.” Icebox cakes, which bring back memories of sweet grandmas and their retro refrigerators, have been around forever, but like many desserts from a bygone era, they usually tend to be decadent. Luckily, there are now healthy icebox cake options, including dairy-free, gluten-free, or even Paleo choices! Lighten up the notoriously dense cheesecake. “Light cheesecake” may seem like an oxymoron, but I’ve made a light, no-bake cheesecake before, and trust me when I say, the lighter version is better than the original. Rethink the beloved peanut butter and chocolate combo. Chocolate and peanut butter is arguably the perfect dessert pair. Lighten it up with this vegan chocolate peanut butter crisp ball recipe that couldn’t be easier to make!